“Do I really need to wear a serum?,” is what you might moan. Not just for your face, but for your eyes as well? If you’ve been shopping around for some new skincare these days, you might find yourself perusing through a multitude of eye products with words like “treatment,” “essence” and “serum” on them. What happened to good old-fashioned eye cream? Technology happened. Looks like another step is necessary to really stop those unwanted wrinkles, dark circles and puffs from forming in the first place. Good news is, we spoke with Dr. Daniel Stangl, Director of Innovation at La Prairie, to tell us more about the NEW! La Prairie Cellular Eye Essence Platinum Rare. Dr. Stangl knows that women are looking for long-term results and immediate satisfaction when it comes to skincare, which can be seen using the essence’s Lifting and Tightening Complex. “It imparts an instant look of lift and firmness that lasts for several hours,” explains Dr. Stangl. And did you know that your skin’s DNA (peptide-destroying enzymes to be exact) is actually trying to prevent you from looking young! Read on to find out more about this revolutionary eye essence, and why you need to add it to your regimen. Also, check out our Top 10 Eye Treatment picks to cover all your delicate eye area needs like dryness, dark circles, crow’s feet and more! BeautyStat: What is the importance of an eye serum/treatment? DS: The area around our eyes is among the most delicate skin on our face. Using an eye cream and serum can help eliminate signs of aging and often are formulated to work in synergy with one another. Like a facial serum, an eye serum is going to set the stage for more effective results with any product you layer over it. It’s also formulated with more targeted ingredients that are delivered to the depths [of the skin] where they’re needed. With Cellular Eye Essence Platinum Rare, we are able to address lines and wrinkles, dryness, darkness under the eye and puffiness. BeautyStat: Can you wear it alone or under eye cream? DS: The Cellular Eye Essence Platinum Rare can be worn alone, however, we do recommend layering it. Cellular Eye Essence Platinum Rare offers amplified results when layered underneath Cellular Eye Cream Platinum Rare – or your eye cream of choice. We developed the products [Cellular Eye Cream Platinum Rare and Cellular Eye Essence Platinum Rare] to work synergistically with one another for maximum benefits. BeautyStat: What makes the new eye essence from La Prairie so special/different from the rest? DS: The main breakthrough in the Cellular Eye Essence Platinum Rare is a powerful Platinum Peptide – an optimized compound based on platinum particles combined with an age-fighting Tetrapeptide. What’s extraordinary is that through this binding of Platinum with the peptides, this newly formed Platinum Peptide is protected from peptide-destroying enzymes that are naturally occurring in the skin. Therefore, allowing it to work more effectively and longer. This Platinum Peptide helps enhance firmness, reduce wrinkles in the eye area and improve skin elasticity and hydration. It’s worth noting that it targets specific challenges more intensely with benefits derived from technology not available until now. AHAVA Dead Sea Osmoter™ Eye Concentrate Youth & Cellular Energizing Serum: Say so long to puffiness and dark circles with this silk-textured eye concentrate. Cucumber and aloe vera calm the skin, while Persian silk and siegesbeckia orientalis extracts strengthen the dermal structure to fight signs of fatigue and stress. Avon ANEW CLINICAL Absolute Even Dark Circle Corrector: The custom flexible tip allows for comfortable and precise application of the Shadow Erase Complex Technology and self-adjusting sheer optics, designed to match different skintones and illuminate the eyes. Fennel fruit extract and kudzu root make eyes look instantly brighter! Kiehl’s Super Multi-Corrective Eye-Opening Serum: Suitable for sensitive eyes, this 5-in-1 eye solution lifts, firms, smooths, hydrates and restores a youthful shape to the eye. Skin looks visibly firmer and lifted; texture looks more refined in less than one week! The Body Shop Drops of Youth™ Eye Concentrate: Applied using a roller ball, this rich concentrate is infused with Edelweiss flower extract to promote skin renewal properties for a smoother-looking, fresher eye contour and reduced appearance of eye bags. TIP: Use the roller ball to create a figure 8 motion around the entire eye area; it will gently massage and stimulate blood flow. 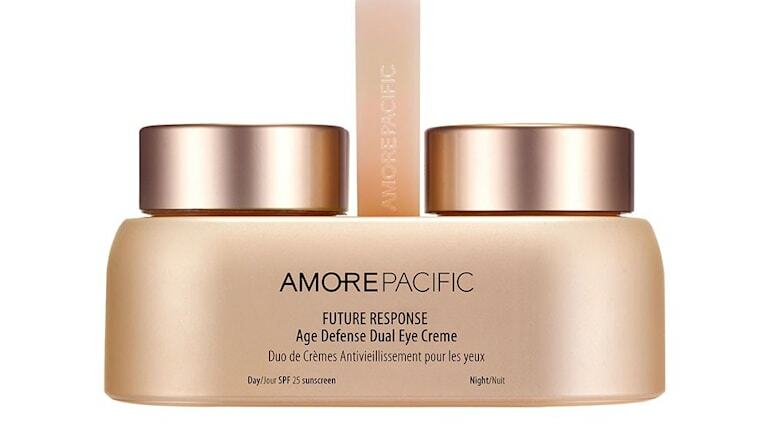 AmorePacific Future Response Age Defense Dual Eye Creme: This pair of multifunctional eye treatment creams offer daytime defense from environmental aggressors and nighttime recovery from daily damage. The day eye cream contains a FUTURE RESPONSE Complex™, a potent blend of green tea and pine mushroom that protects eyes; night eye cream reduces crow’s feet, supports natural collagen production and skin turnover, improves elasticity and depuffs. philosophy Time In A Bottle™ For Eyes: A daily anti-aging serum that brightens, tightens and smooths the appearance of the delicate eye contour. A DNA renewal complex helps promote skin’s natural renewal and protection processes, while a patented antioxidant repair complex helps provide powerful antioxidant protection. Estee Lauder Advanced Night Repair Eye Serum Synchronized Complex II: Anti-pollution technology found in this concentrated eye serum helps significantly inhibit the appearance of visible damage from environmental assaults. Darphin Ideal Resource Anti-Dark Circle Eye Illuminator: Translucent Optics Technology features micro-particles that capture light and instantly illuminate the eye area. Vitamin C, mulberry root and scutelleria extract help stimulate micro-circulation when massaged into the skin. Coupled with the cooling massage of the metallic tip, the eye area appears brighter, more luminous and younger-looking. Perricone MD Acyl-Glutathione Eye Lid Serum: This particular serum replenishes skin’s glutathione levels around the eye, dramatically improving the visible signs of accelerated aging along the upper eye lid area to deliver a youthful, more wide-eyed appearance. It also works great as a primer to enhance a smoother application. Do any of you beauties already use an eye serum/treatment/essence? Do you think by adding one to your regimen will help you appear younger-looking? Previous Preview, Ingredients, Photos: NARS Cosmetics All Day Luminous Powder Foundation, NARSskin Restorative Night Treatment Transforms From A Gel To An Oil! La Prairie! As I’m over 40 I need some good help to make sure that I’m not aging too soon.